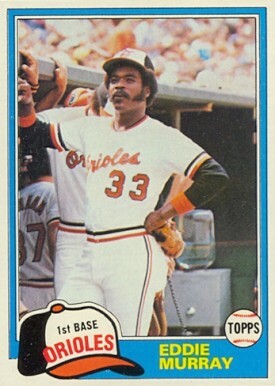 Eddie Murray played in 3,026 games over 21 years in The Show and wore No. 33 for all of them, and the very first time was Opening Day of 1977 for the Orioles in front of 31,307 at old Memorial Stadium. There were future Hall of Famers all over the place. One was Baltimore manager Earl Weaver, who immediately penciled in the young switch-hitter from Los Angeles as his No. 5 hitter. Jim Palmer and Bert Blyleven dueled on the mound that day. Gaylord Perry was on the Rangers’ staff, and Brooks Robinson was a Baltimore reserve in the sunset season of his career. Murray was 1 for 4 against Blyleven. After being retired his first two times up in the Major League debut, Murray slapped a single that led to the Orioles’ only run in a 2-1 loss. For a similar theme, fast-forward five years at the same ballpark: April 5, 1982. Murray was one of three future Hall of Famers in the lineup as the Royals visited the Orioles. The other two included a young Baltimore teammate named Cal Ripken Jr., who was making his first Opening Day appearance after a partial season in 1981, and George Brett on the Kansas City side. Murray hit one of his 504 career homers that day, and was the exclamation mark on a huge day for the Orioles. The first baseman slugged a grand slam off Dennis Leonard in the third inning, turning a 2-1 lead into a romp. Your browser does not support iframes. Your browser does not support iframes. Your browser does not support iframes. Your browser does not support iframes. Wow! This will be a nice leisurely stroll to opening day. How about Tom Browning, or, Steve Carlton for #32? Oh!…Ok, I hadn’t realized that he had a perfect game and not on opening day. Still, thank you for your consideration for a #32 entry to opening day countdown. Some seasons are more memorable than others. 1969 probably stands out for most Cubs fans. Eddie Murray a low key guy who always showed up to the game and did his thing,one of my favorites growing up.